Rush Orders – Our Specialty! At A Stars & Stripes Flag Corporation, our expert team will work with you to create that perfect custom flag for your flagpole to show your pride. With our state-of-the-art manufacturing process, superior color matching quality and top-notch customer service, we’ll make sure your custom flags are made right and make you and your home, office and community LOOK good. Design Your Flagpole Flag Today! We have over 3 decades experience making custom flags and going above and beyond our customers’ expectations. We can’t wait to work with you on your custom flag order. A Stars & Stripes Flag Corporation also provides flagpoles and accessories. Customized for outdoor or indoor use. Made with heading and grommets, our custom outdoor flagpole flag is the most commonly displayed flag and is typically flown horizontally on a vertical freestanding outdoor flagpole. Some outdoor custom flags are finished with a pole sleeve. Our custom indoor flag with a pole hem* is typically hung indoors on smaller freestanding flagpole or carried in parades. *A pole hem is a sewn sleeve that matches the material of the flag and is flannel lined with a leather tab to attach the flag to the pole. The pole hem can be either on the top or side of the flag so it can be hung horizontally or vertically. At A Stars & Stripes Flag Corporation, we can make any shape or size flagpole flag to suit your preferences. As well, our digital printing process allows us to print any design regardless of the number of colors or complexity of the design. Send your message to your community with a flagpole flag today! Complete and send us our easy to use quote form letting us know the type of personalized flag or banner you’d like to create, the quantity and time frame you need. We will reply with the ideal process and provide you the best pricing for your product. Send us the image you want on your flag or banner. If you don’t have an image, tell us your vision. We will send you a proof of your design for review and approval. Provide your shipping and payment information to us and we will send you your personalized flag in 7-10 business days or less depending on your needs and product. A Stars & Stripes Flag Corporation is here to serve you backed by over three decades of experience making custom flags. We take pride in our providing all of our customers with the highest level of service. All of our custom flags are made in the U.S.A. of the highest quality materials using state of the art processes. We can make your custom flagpole flags using your professionally designed logo with specific brand standards or we can work with you to create your design from scratch and every option in between. 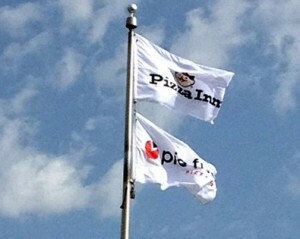 Our customers come back year after year to order their custom flags because of the quality and service they received. Contact us to create your custom flag!